Skokloster Castle towers over Lake Melaren ten kilometers to the north-west of Sigtuna. 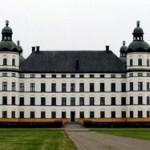 The Castle is one of the most remarkable sights of the Swedish Royalty. It was built by the order of a Field-Marshal Carl Gustaf Wrangel. As a military commander and the participant of the Thirty Years’ War he was generously awarded by the King. A white quadrangular building with four towers in the corners with baroque superstructures and the inner yard has an indubitable resemblance to his Spyker Castle located on the knight’s island of Rugen in Stockholm, where he died in 1676. Spyker Castle had been built in 1652 – 1670 by Nicodemus Tessin the Elder and was burnt down in 1802. 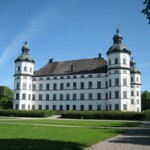 The Castle of Skokloster was being built throughout fifteen years since 1653 to 1668 by the architects Nicodemus Tessin the Elder and Caspar Vogel. The interiors of the castle had been ready by 1779. The superb modelling of ceilings, parquet-flooring, woodcarving, tapestry, pictures, furniture, books e. t. c. have especially well preserved to our times. The largest world collection of military weapons, gathered as the military trophies captured by Carl Gustaf Wrangel during the Thirty Years’ War has been preserved in the Castle. Polish pistols, Turkish yataghans, crossbows, armour, daggers, a royal shield with the gold incisions from Prague seized at the end of the Thirty Years’ War, and many other unique objects have been hang out and put in the Armoury room in such a way as it had been done by Wrangel himself. Many antiquarian rarities got into Skokloster from the castles of Danish nobility located on the islands of Fyn and Shelland, after the winter campaign of 1657 – 1658, when Carl X Gustaf’s cavalry had crossed the frozen channels of Store and Little Belts. To the right of Skokloster there is the 13th century church of the nunnery, where Wrangel’s military trophies have also been preserved. A font basin, a pulpit and sculptures were brought from Polish Oliva monastery in 1656. Carl Gustaf Wrangel built Skokloster Castle as a memorial to his family. But only three daughters of his fifteen children survived. 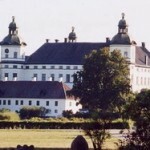 After the marriage of the eldest daughter Margareta Juliana Wrangel the Castle passed to the Brahe family another old Swedish clan of nobility. In 1930 the last representative of the Brahe family died and Rutger von Essen became the owner of the Castle. In 1967 he sold the Castle and its contents (over 20 000 objects of antiques and about 30 000 books) to the Swedish government. In the same year the Castle was opened for visitors. In 1970-ies the Castle was renovated under the supervision of Ove Hidemark. Nowdays it is run as a museum of Skokloster and opened for visitors. The Castle is surrounded with a gorgeous park.